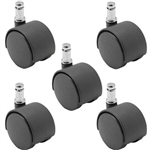 For the best selection in stem mount caters, BuyCasters has you covered. We carry grip ring stem casters, expandable adapter stem casters and threaded stems. Each comes standard with a metal dust cap covering the upper raceway, ensuring you get the most value from your purchase.Threaded casters are most popular in the institutional and food service industry but can be used in a variety of places. If you’re in the food service industry, you’ll love the dual functionality of our locking casters and swivel casters with brakes. These threaded swivel casters offer sturdy functionality and increased mobility to move food from one location to another, but the brakes and locks allow for your carts to also double as reliable storage units when moving is no longer required. These are also really popular casters for chairs thanks to their great reliability and low price. BuyCasters offers quality stem casters with a variety of options. Bulk quantity discounts are available. For any questions finding the caster right for you, please call us at 1855-WHEEL11 (855-943-3511). Light / Medium Duty 3" x 1-1/4" Expandable Adapter Stem Caster with high capacity TPR Soft Rubber Wheel. Brake and Stem Options Available. Light / Medium Duty 3" x 1-1/4" Grip Ring Stem Caster with Gray High Capacity Soft TPR Rubber Wheel. Brake and Stem Options Available. Light / Medium Duty 4" x 1-1/4" Expandable Adapter Stem Caster with high capacity TPR Soft Rubber Wheel. Brake and Stem Options Available.